With all the rain on Saturday and the clocks going back it’s beginning to feel really wintery. So this weekend it was definitely time to cook up some some real comfort food. I’ve been feeling a little under the weather this week so this was the perfect dinner to enjoy snuggled up under a blanket watching stuff on Netflix. Put the potatoes in a medium pan and cover with cold water. Add ½ tsp salt, turn the heat on high until the water to boils. Reduce the heat so the water is simmering and cook for 15 to 20 minutes, or until you can easily poke through them with a fork. Whilst the potatoes are cooking grill your sausages for around 15 minutes or until they are golden brown. In a small pan fry the onion in the rapeseed oil over a medium heat until softened. Make the gravy according to the instructions and add to the cooked onion. When the potatoes are done drain the water and allow to steam dry for a minute. Return to the pan and add the butter and half of the milk and mash the potatoes until smooth. If the potatoes are too dry add the rest of the milk. Don’t over mash the potatoes as they can go gluey. Stir the watercress into the hot mash and season to taste. 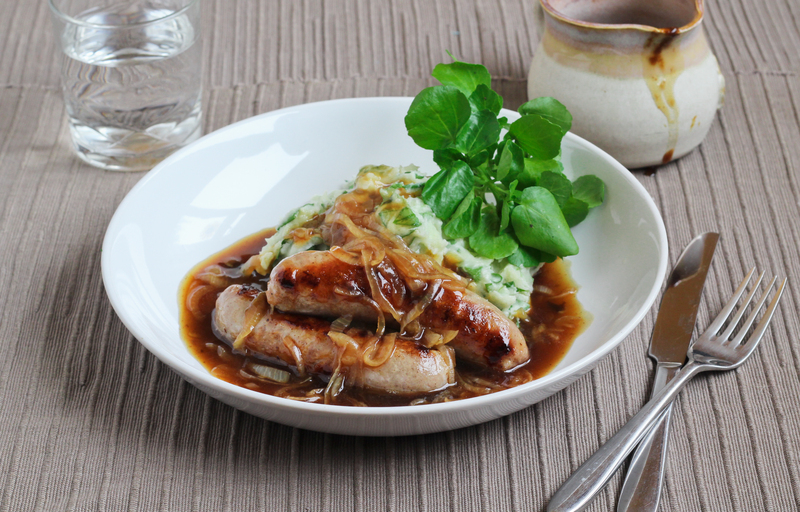 Divide the mash and sausages between two bowls, pour over the gravy and enjoy.